We enjoyed thoroughly this dish with sambar rice for our lunch, both sambar rice and this mildly bitter potato curry makes a prefect pair. Also we had the leftover aloo methi sabzi with rotis for our dinner, yes this curry goes very well as side dish along with our humble rotis. 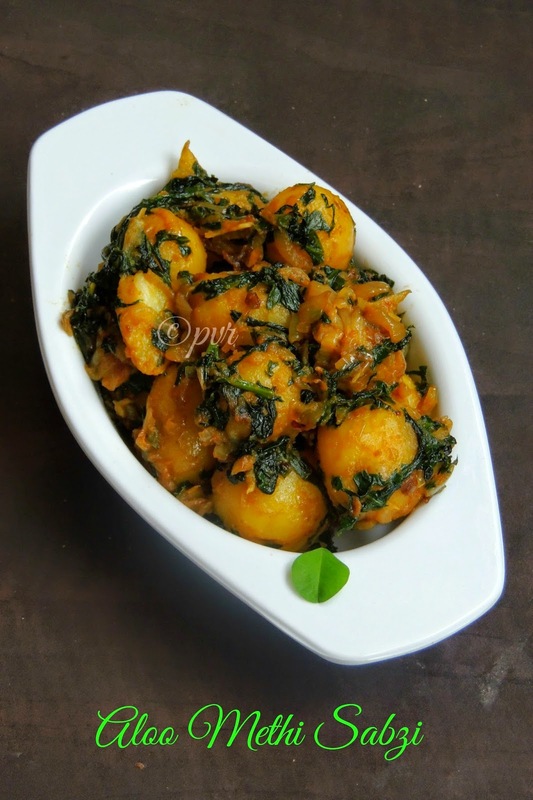 This dry potato curry can be prepared in a jiffy and if you dont get baby potatoes just get your usual potatoes to make it.Potatoes in any forms is almost everyone's favourite, there is nothing harm to add this bitter fenugreek leaves while making this simple potato curry. Personally sneaking methi leaves this way is definitely the best method i have found to feed my family. Heat enough oil in a pan, let crack the cumin seeds, add in the crushed garlic, chopped green chillies, fry until a nice aroma comes. Add in the chopped onions, salt,cook until the onions turns transculent. Now add the cooked,peeled baby potatoes, fry for few minutes. Add the chopped fenugreek leaves, coriander powder, chilly powder, turmeric powder, asafoetida powder, saute everything until the potatoes gets well coated. Cook covered for few minutes in simmer, dont forget to stir occasionally. Once the potatoes gets well coated with the spices and greens,put off the stove. oh yum with some rasam or curd rice. Aloo and Methi a lovely combo. A real drool worthy dish. Awesome sabzi. Love the combination. Looks very flavourful and delicious. Those potatoes look so tempting Priya....my comfort food! yumm this looks so good!!! 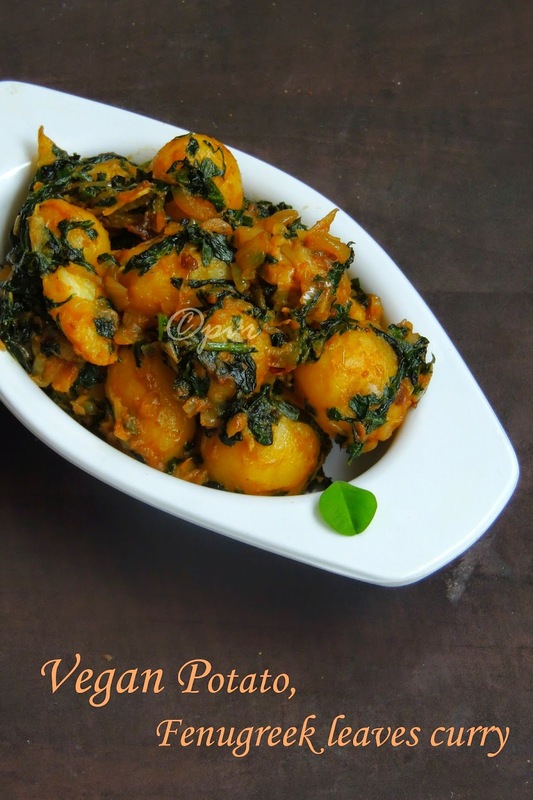 My favorite side dish with potato!